Arbeit und Recht, a journal for industrial law practice, is a legal technical periodical with 50 years of scientific tradition. In close co-operation with the jurisdiction and the unionized legal protection it offers a forum for political papers for the legislation and application of laws. Special characteristics of this technical periodical are background information from first sources as well as the special column extra. Beyond that, annually over 450 judicial rulings in the express service, in guiding principles and in full text, frequently with legal note, are documented. View the current issue of Arbeit und Recht by clicking here. 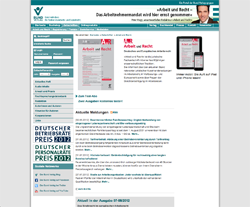 A subscription to Arbeit und Recht can be ordered online. Single Issue: Euro € 14.00 including postage. Prices subject to change in 2012. Please click here to view the Author Guidelines for Arbeit und Recht.